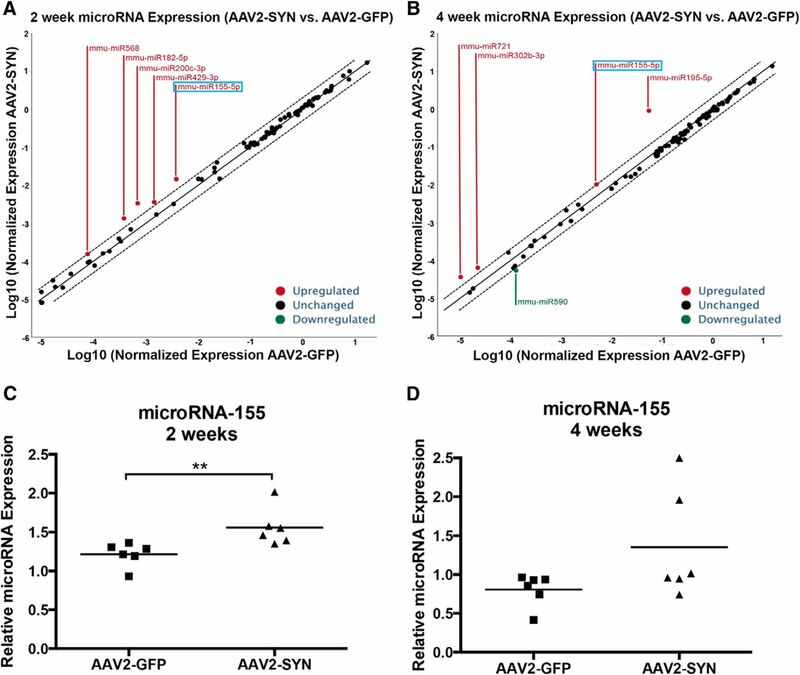 AAV2-SYN overexpression induces microRNA-155 in the SNpc. A, B, Multiple microRNAs are increased at 2 weeks and 4 weeks after transduction of AAV2-SYN compared with AAV-GFP-injected animals. miR-155 was found to be increased at both time points. microRNAs were measured and quantified using the Qiagen Inflammatory Response and Autoimmunity miScript miRNA PCR array and miScript PCR Array Data Analysis Tool. Samples were pooled from n = 6 animals per group with four replicates of each group per plate. C, D, Increased miR-155 expression confirmed at 2 weeks after transduction of AAV2-SYN using probes designed for the mature miR-155 sequences. Animals were studied individually using n = 6 animals per group. At 2 weeks, miR-155 was significantly increased (p = 0.0144, Student's t test). At 4 weeks, there was a trend for increased miR-155 that did not reach significance (p = 0.0688, Student's t test). Knock-out of miR-155 attenuates AAV2-SYN induced microgliosis in vivo. A, Increased expression of MHCII (red) in surrounding AAV2-SYN (green- infected TH+ neurons (blue) in the SNpc at 4 weeks after transduction of the virus. This increase in MHCII is absent in miR-155−/− animals. Representative images were captured using a Leica TPS-SP5 laser scanning confocal microscope and processed using Adobe Photoshop. Scale bar, 100 μm. B, Increased CD68 (red) in WT animals at 4 weeks after transduction of AAV2-SYN (green) into the SNpc (TH, blue) compared with WT AAV2-GFP. miR-155−/− reduces CD68+ microgliosis in response to overexpression of α-syn. Scale bar, 50 μm. C, Quantification of MHCII intensity assessed after DAB staining of sections for MHCII and TH. Coded slides were assessed a score of 0 (no staining)- 4 (most intense staining) based on the expression of MHCII in the SNpc. Quantification performed with n = 6 per group and statistical significance assessed using a Kruskal–Wallis test with Dunn's multiple-comparisons test (p = 0.0146). miR-155 knock-out blocks neurodegeneration induced by AAV2-SYN in vivo. Six months after transduction of virus, dopaminergic, TH+ neurons were quantified using unbiased stereology to assess neurodegeneration. 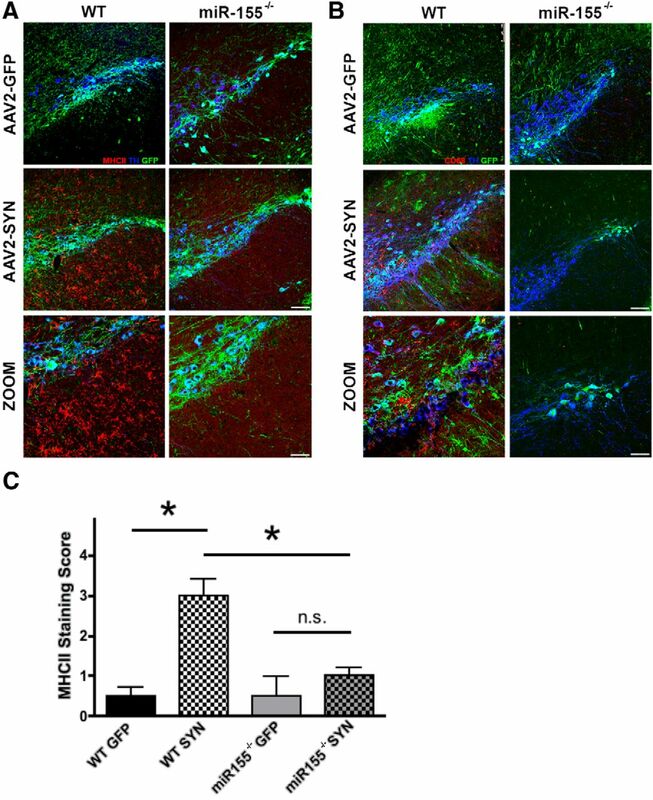 A, Representative images ipsilateral to the injection of either AAV2-GFP or AAV2-SYN that are stained with DAB for the TH+ neurons in both WT and miR-155−/− mice. B, Quantification of TH+ neurons in the SNpc using unbiased stereology. There was a 29.72% loss of TH+ neurons in the SNpc of WT mice at 6 months after transduction of AAV2-SYN compared with AAV2-GFP (***p < 0.0001, n = 8–10 mice per treatment group). miR-155−/− mice showed only a slight loss (2.97%) that did not reach statistical significance. Counts are expressed as a percentage of neurons in each ipsilateral SNpc compared with neurons in the contralateral SNpc of the same animal. Data were analyzed using one-way ANOVA with Bonferroni's multiple-comparison post hoc test. 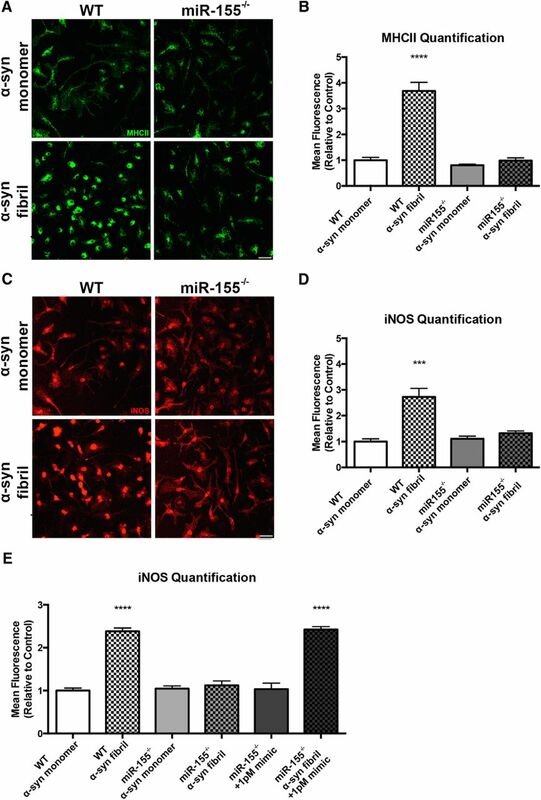 miR-155 is required for upregulation of microglial MHCII and iNOS in response to fibrillized α-syn. Using primary microglia derived from postnatal day 0–3 mouse pups, proinflammatory markers were assessed in α-syn-reactive microglia from WT and miR-155−/− mice. Scale bar, 25 μm. A, B, Primary microglia were treated with α-syn fibrils (200 ng/ml) for 2 h. Increases in MHCII expression (green) were captured using immunocytochemistry. Microglial fluorescence showed increased MHCII expression in response to the addition of α-syn fibrils and this finding was ablated in microglia lacking miR-155. C, D, Imaging and quantification of iNOS staining (red) in microglia after the addition of α-syn fibrils (200 ng/ml) for 2 h in WT and miR-155−/− microglia. Increased iNOS staining was seen in WT microglia after the addition of α-syn and this increased expression of iNOS was not seen in miR-155−/− microglia. E, Independent experiment quantifying iNOS staining in microglia after α-syn fibrils (200 ng/ml) for 2 h in WT and miR-155−/− microglia, along with pretreatment overnight (18 h) of 1 pm miR-155 mimic into miR-155−/− microglia. Quantification of the fluorescence was performed using ImageJ to analyze the mean fluorescence of individual microglia. Four images were taken per chamber of a chamber slide that contains four chambers and quantification is reported as the mean value with SEM. Statistics were run using ***p < 0.001, ****p < 0.0001, one-way ANOVA with Tukey's multiple-comparisons test.